Baseball enthusiasts may have many ways of celebrating “America’s Favorite Pastime.” Some people keep season tickets to their favorite team; others make it a goal to visit all the famous ballparks around the country. Still others take a pilgrimage to a small town (well, village, technically) in Upstate New York to visit the National Baseball Hall of Fame. It’s a meaningful trip to make for the serious baseball enthusiast, but it’s also entertaining for anyone whom enthusiast can cajole to accompany them! The National Baseball Hall of Fame opened in 1939. The museum houses over 40,000 baseball artifacts (including a baseball that dates back to the 19th century), and it accumulates more each year. It also houses a library and research center. Every summer, the museum hosts a Hall of Fame Weekend. In 2018, more than 50 Hall of Famers are expected to return for a series of ceremonies. This may be the perfect time for a trip to Cooperstown, since the event will also include lots of family programs, like the Parade of Legends. Why was this tiny village selected to be the home of such a prestigious museum? Well, around the turn of the 20th century, a group called the Spalding Commission, which was on a hunt for the origin of baseball, determined that Union Army officer Abner Doubleday invented the game in Cooperstown in 1839. By the time this myth was debunked, the museum was firmly established in Cooperstown and wasn’t going anywhere. Maybe you haven’t yet been to Cooperstown because it just doesn’t seem like it would have a lot to offer. The major baseball parks in America (e.g., Wrigley Field, Petco Park, Yankee Stadium) are in major cities, so a trip to see one of these landmarks is easy to augment with a tour of the particular city’s other major attractions. But even though Cooperstown sports only a little over 2,000 residents, it still has plenty to offer. The village is home to an array of singular boutiques and shops, which you can visit as you take the charming trolley around town. In addition to the Baseball Hall of Fame are other incredible museums. The Farmers’ Museum is one of the country’s oldest outdoor living history museums. The Fenimore House Museum hosts an extensive collection of folk art. Glimmerglass Opera hosts a well-known and respected opera festival in the summers that produces classical opera, new works, musicals, and even hosts popular singers. Twice a week, there’s a huge farmer’s market in Cooperstown, as well as a couple fun breweries. If you visit, you must take advantage of all the outdoor opportunities. There are great parks, hiking venues, and and all kinds of winter sports (when the snowy season comes). You can do boat tours of Otsego Lake and take a look at the Goodyear Sanctuary wetlands. When you come back to shore, why not picnic at one of the neighboring parks? Perhaps the one greatest hindrance to getting to Cooperstown is, well, the getting there. It’s in Upstate New York, and it’s not particularly close to any airports. Your best option is either to make the road trip there, or to take a taxi from other Upstate New York airports. Fortunately, Absolute Taxi offers a reliable and reasonably-priced car service to and from Cooperstown and both the Albany and Syracuse airports. If you visit over Memorial Day weekend, you can get a glimpse of former Major League players and baseball Hall of Famers who come in for an annual event held at Doubleday Field. But it may get really busy! You’ll want to strategically plan your travel--but, of course, this is true no matter what time of year you decide to visit. Once again, taking a taxi from from one of the bigger airports in the region is probably your best bet. 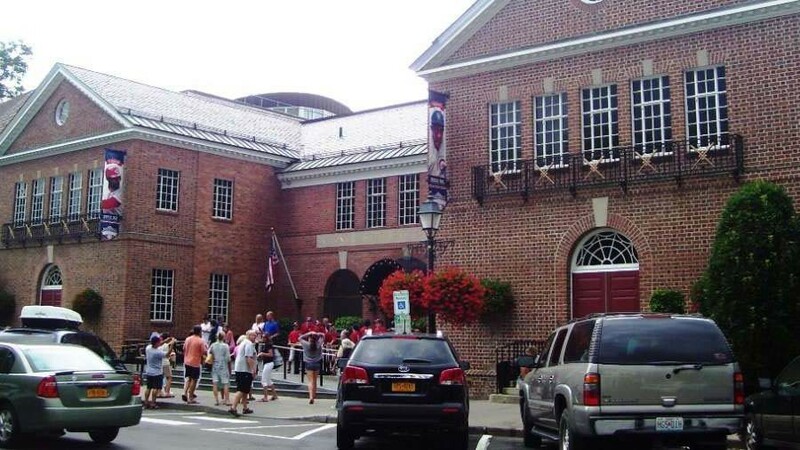 After all, parking is limited in Cooperstown, so if you’re visiting during an especially busy time, it will be more convenient not to have a car to worry about. Our reliable taxi service will get you to and from your amazing location without hassle, so you can focus on your pilgrimage to the Home of Baseball.